Red Witch Violetta Delay Review – Best Analog Voiced Delay Pedal? Red Witch have garnered quite a reputation over the years as a builder of premium analog guitar pedals of uncompromising audio quality. Diverse pedals such as the Empress Chorus, Synthotron, and Fuzz God II showcase this expertise well. Insistent on exploring new frontiers, Red Witch released their Seven Sisters line of effects featuring 7 different flavors of signal processing in a compact mini enclosure at a very affordable price point. Now with the Violetta Delay, the first offering in their Original Chrome Series, Red Witch have bridged the gap between premium tone and affordable, compact pedal design. The Violetta Delay is absolutely stunning to behold with a gorgeous, glossy chrome exterior. Even the sleek packaging exudes class and a premium vibe. This is a feature-packed pedal, too, surpassing many delay pedals costing much more. And while price isn’t a factor I typically focus on when reviewing a product, one of the most remarkable features of the Violetta Delay is simply how much it offers for so little. Red Witch have a product on their hands that could shape up to be a real hit and a sign of things to come with forthcoming entries in their Original Chrome Series pedals. But what’s most important is simply how good the Violetta Delay sounds. Is it the best analog voiced delay pedal around? You’ll find out in our Red Witch Violetta Delay review. Delay control knob adjusts delay time up to 1000ms. Mix control knob blends wet and dry signals to taste. Mod control knob adds modulation from shimmering sparkle to tape echo wow and flutter. Repeat control knob adjusts from single slap-back style delay to runaway self oscillation. Exp Pedal output allows control of the delay repeats in real-time via expression pedal (1/8” to ¼” adapter included). True Bypass switching for letting your signal pass unaffected when disengaged. Powered by internal lithium ion rechargeable battery or external 9VDC power supply. 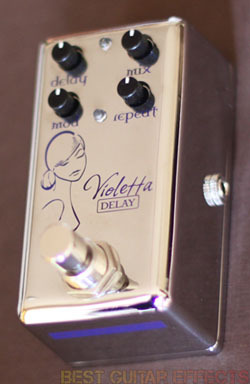 Visit Red Witch for more info about the Violetta Delay. Upon first unboxing your lovely new Violetta Delay, she must be charged for 12 hours. I know, I know. After getting your shiny new chrome toy, you just can’t wait to plug her in and jam. Don’t worry. A little more patience pays off. Plugging the Violetta Delay into a standard Boss-style power adapter and leaving her plugged in overnight does the trick nicely. It’ll give you some time to dream about the awesome music you’re going to make the next day. After the initial charge the lithium ion battery will only take around 4 hours to fully charge. So now that she’s all charged up and ready to go, it’s time to plug in. I tried the Violetta Delay with various assortments of clean and dirty sounds, humbuckers and single-coil pickups. The delay responds consistently in various playing conditions as is expected, but the tonal character of the Violetta Delay is what’s really special about this pedal. I started with the Mod and Repeat all the way down, the Delay around 8 or 9 o’clock, and the Mix at noon. This produces a reasonably fast single repeat with a slap-back feel. The Tone of the Violetta Delay is darker than your dry signal with plenty of high end roll-off that’s characteristic of the most sought-after analog delay tones. It’s a tone that really sits in well with your dry signal for a warm, vintage vibe. Rolling up the Mod knob just a bit brings in a touch of movement. The modulation is less apparent on single note runs when using low Repeat settings. Try playing some jangly clean chords, and you’ll be treated to a pleasing chorus-like tone with warmth and depth. Boosting the Mod knob only further enhances the mesmerizing effect with more intense movement. Pushing the Delay and Repeat knobs up to around 10 or 11 o’clock produces longer delay times with more repeats. By setting the Violetta Delay to longer delay times, you can really hear the delay dissipating with each successive repeat, decaying naturally and darkening in timbre. The modulation starts becoming more fun to use here with noticeable tape-like effects when rolling the Mod knob up towards noon and beyond. There’s plenty of old-school delay charm. The Violetta Delay sounds convincingly analog-like and would certainly fool many guitarists in a double-blind test. When you take the Repeat control past noon, the Violetta Delay starts to self-oscillate. Once this starts to happen, you can have all kinds of fun manually adjusting the Delay and Repeat controls to create washes of noise and interesting effects ranging from ambient to extreme. You can also use an expression pedal to control the feedback, overriding the Repeat knob and providing real-time control. Using an expression pedal you can easily take the Violetta Delay from single and multiple repeats all the way over the edge with self-oscillation. Then reign it in by rocking the expression pedal back to the heel position. This is a useful addition that performing musicians will appreciate. Red Witch’s inclusion of a rechargeable lithium ion battery is an interesting feature. They first pioneered this in guitar effects pedals with their Seven Sisters series, and they’ve continued the trend with the Violetta Delay. The battery will hold enough charge for up to 24 hours on continuous use and should last for 2 years or longer. It will charge anytime you use the Violetta Delay with a power adapter. And should you ever misplace your power supply, the Violetta Delay will probably have plenty of charge to get you through a rehearsal or gig. One more point to touch on that I don’t normally cover in reviews is price. Good tone is priceless to me, and I never mind paying for premium sound-quality. 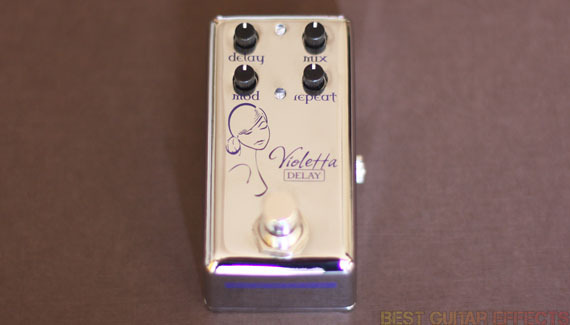 But the Violetta Delay really breaks the mold by not breaking the bank. Never before has such a feature-rich delay pedal in such a convenient, compact package been made available for such a bargain price. At the price-point that Red Witch are practically giving away these pedals at, the Violetta Delay may find its way into the hands of many guitarists who want exceptional delay tone on a budget. While cost can sometimes be a hinderance to getting high-quality gear, the Violetta Delay makes price a non-issue and an even more enticing consideration. This pedal sounds fantastic and has all the makings of a hit. Let’s see the final result. The Red Witch Violetta Delay is one of the best sounding analog-style, compact delay pedals. It’s got more style and class than most pedals. It offers plenty of control and longer delay times than most compact delay pedals in its price range. Most importantly, the Violetta Delay sounds awesome. It captures all the warmth and beauty of classic analog delays with a low price and convenient size that should help it find a place on many pedalboards. Looking for the best analog voiced delay pedal? The Red Witch Violetta Delay is tough to beat. That concludes our Red Witch Violetta Delay review. Thanks for reading. Want to buy the Red Witch Violetta Delay? This a rad yet simple pedal. PS the earthquake devices dispatch master deserves to be on the list. Man that sounds amazing, Its too shiny to not have! Sounds pretty sweet. And so shiny! Great Delay pedal definitely one to add to the collection. Looks really nice. I’m on the fence with the whole rechargeable battery thing. It’s a cool option but I can’t see myself using it in any situation. Pedal sounds super good though. Big fan of the sound. I am a big fan of delay and the Violetta has lots of analog glow & dirt feedback. Oh yeah! 5 seconds into the demo, I knew I wanted a Violetta for my board! I am ALL ABOUT Old School, kids…yessir. Thanks for the chance to win a Red Witch! Incredibly full featured, yet surprisingly affordable. Wow! I want one. Love the sound and expression pedal input is great! Wow, could really use this. Hope it pans out! This delay would be great with my analog synth as well. Sounds really solid, and it’s very cheap for Red Witch. Might have to splurge. The sound gives a real feeling of nostalgia, feels nice ! Impressive delay, I’m actually looking for one to start off with and if I could I would surely pick this one. Already love the Empress. The more controls the better on a delay box and this one looks like it can take a beating. Stunning work, all the way from windy Wellington. great sounding compact pedal! crossing my fingers and making a space on my pedalboard………. As a big david gilmour fan delay and acho is a must. Nice pedal. Great sounds! Thanks for the giveaway! Love the big sound from such a small package. Leaving a comment for the giveaway entry. This pedal actually sounds pretty decent. For an “analog”,voiced digital delay this one seems to be one of the nicer sounding ones. Sort of nails the warmth of actual analog but,at the same time you get the benefits of digital, and the battery is pretty cool too! And such a tiny box! Great time for guitarists these days; awesome effects, amazing guitars and amps from boutique makers. I wonder how it compares with MXR carbon copy for analog delay sound? This thing sounds like glaciers moving! The Jeff Boyle video is absolutely perfect. “Solace” by Jakob is one of my favorite albums of all time. Love the tone! Classic, warm, amazing!! It would be great to have this pedal. I would love to have this pedal to compare to the analog way huge aqua puss I own. Such a delicious delay. Love the modulation particularly. Definitely on the wish-list. Such an innovative pedal! I want one! currently not looking for another delay at the moment, but this is a very nice little unit, if i were, this is very useful and compact! This pedal is amazing! So versatile. I currently don’t have a delay pedal and this is the one on my wishlist. Expression pedal control, wow. With a chargable battery. And beautiful sound. Red Witch never seizes to amaze. I own and use three delays atm, this would be a sweet addition to the bunch. An amazing pedal, created by an amazing guy. Definitely worth buying from a company like Redwitch. This pedal looks awesome! Great review. Delay. The only effect I absolutely can not live without. Small size, incredible look. What’s not to love? Sounds sweet! Thanks for the chance at these babies! Good Luck all…………….Cheers! I had it in my head that the Seven Sisters range were going to be the only small footprint pedals Red Witch were going to make since they collectively covered so much territory, but I’m glad they decided to push the envelope further with this little blighter. I’m also thrilled they included a long delay time. We need more of that outside of $400 digital behemoths. Red Witch pedals look as good as they sound. The violetta is a beautiful looking pedal that would look at sound beautiful in my pedal chain along side my Medusa. Red Witch pedals are the best… Violetta is the next pedal I want/need/must have on my board. I think i forgot to coment on this, but glad i remembered. Could really use a replacement for my long delay that I had to sell! this is soooo cool !! :D i want it!! Small footprint, authentic sounding analog delay. Thanks for the opputunity! Excellent tone, not a ton of $$$ great demo too! It looks so beautiful!! I wanna win it!!! Gimme gimme gimme! Would look, & more so, sound great right next to my Moon Phaser. WOW! I was heavily leaning towards the MXR Carbon Copy as my first delay pedal, but after reading this review, I seriously might have to reconsider. The review was excellent and made me really want to give the Violetta a try! VioDelay, that’s what I need! Man, this sounds great! I love how Red Witch has taken the Violet Delay and upgraded it in a really awesome way, giving players an option in between the Violet and Titan pedals. I hope they do the same with the rest of the Seven Sisters line of pedals. Beautiful looking pedal, I’ve always been a fan of Red Witch’s designs. your products look great.. This devices are so essential for doing wild stuffs with the guitar. This thing is really amazing. I think where it really shines is with modulation. This is another great pedal from the guys at new zeeland. It, s small and looks great. I have the famulus overdrive it, s one of the best pedal you can buy for some great leadtones or chords. I have a Pentavocal and Medusa and absolutely love them! I’m a big fan of Red Witch as a whole, and the demos of the Violetta sound very nice. The aesthetics and small footprint are a big bonus too. I’m looking forward to putting that beauty on my board. (GAS relapse). I like it, sounds great. I like this pedal, because it’s simple and it’s would be a nice addition to your pedal board. Like running it after you delay and reverb pedals to add more dynamic and depth to your sound. And who doesn’t like things in chrome, ooooo shinny. I really like the sound of red witch pedals and yet again another beauty! Seriously warm sounding delay that seems extremely versatile, would love to add this to my rig. Having not the cash or a store that stocks them nearby I guess the closest I will get to owning this pedal is through listening to youtube clips. You don’t see five star reviews that often. May have to work some serious overtime to get this beauty! This pedal sounds amazing transparent! Much wider variety of options compared to other similarly priced yet inferior pedals! It’s an astonishing sound. Perfect bandsound and effective highlights! I think this is very natural sounding delay, with overall price and features! Gotta love the size. while the 12hr charge would leave me liking my chops, using a rechargeable lithium ion battery is pretty damn smart. Nice! this would make a great 2nd delay (if you frequently use delay in your line) or really it would make a first delay for a set and forget situation! Could definitely use one of these! I haven’t played this yet but I love how small it is. The Violetta sounds and looks amazing. Very versatile and loving the unique design. Small footprint, quality sound. Nice work Red Witch! How not to love a chrome pedal!? There should be way more chrome pedals out there! …Hope for RW to put out some other pedals as well in that style. I hope to be able to lay my hands on the Violetta very soon. What I really like about it from the demos so far is the self-oszilation possibility and the dark voicing of the repeats. Will be posting a more detailed review on this pedal when I get it. I actually want 2 of those, especially as they are so small, so winning one would be really cool!!! I’d use one for my regular channel delay tones and one fixed with my fuzz lead tone, both one-step-switchable using my true bypass looper for my lead sound. A touch of that wonderful tape like reverb will make my solo tone come alive for sure. Great pedal – great pedal maker – super cool giveaway! This sounds great. I would love to add one of these to my board. It’s great, you can check there’s nothing in your teeth before the gig starts! Awesome! Gotta love pedals that sound great in small Packages…. I just started playing guitar about four months ago and have purchased The Red Witch Chorus pedal and from doing my research I scored the BEST Chorus pedal on the market. I will always buy top of the line if I can afford it and I know this is a Red Witch product so it’s got to be great…I would love to win this pedal! If not I will just have to go out and buy one…I eventually will own all of The Seven Sisters Pedals…in fact I bought a mini pedal boars just for them…lol…so far I have the black distortion pedal and she rocks! This one is on my radar…. Been wanting one of these for a while!!! Love the way this sounds. Pick me! this thing is so beast. i cant even. I’ve been following Ben as he’s gotten around promoting this little gem and I must say this is one of the most organic sounding non analog delays I’ve ever heard. Great work! Looks like a sweet delay! This delay is as warm as a blanket! This little beauty will replace my Boss DD7 in the future! Classy! 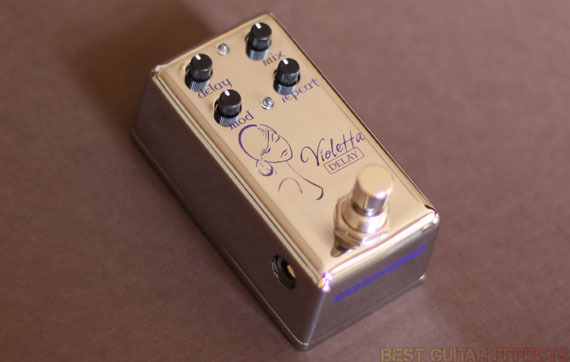 Love Red Witch pedals… Violetta looks great and I’m sure it sounds awesome. I would love to add it to my pedalboard and I hope I win. Thanks for the chance! just got the Grace compression pedal and love it the Violetta Delay is my next one hope I can win it! I have the Ruby fuzz and need to tweak the internal trim-pots, which is not an easy thing to do, because it has a big volume cut when I kick it on. I wonder if this one needs the same adjustments for playing at high volume. I have just enough space on my pedeal board for one of these and a synthotron. Hope I can win one, because I must have it! Beautiful. Every Red Witch pedal I own is outstanding and these “smaller”pedals don’t seem to be any less impressive. This pedal sounds/looks amazing! Gotta have one. Violetta. She’s beautiful. Makes me proud to be a New Zealander. Ben Fulton is a mad genius. Sounds cool. Hope I win this! I love the rechargeable battery feature on this. Less cords, less to worry about. Would love the chance to own and use this. Sounds fantastic. I need a new delay pedal – only running ‘verb at the moment. This would fit the bill perfectly. It seems and sound great, I want it!!! Sounds great, will be nice in my pedal chain!!! Sleek, simple yet really great sounding delay, would love to have this on my board! Can never have enough delay! I love the rechargeable idea! Really nice warm analogue decay. Nice versatility on the time options. And the expression pedal option is a nice bonus. That would be fun to use. If this pedal does what they say, it must be something special! This sounds great! Hope to win! Sick!!! Compact pedals are sweet anyways but it you say it sounds this good, then I would love to try it out! love the rich tone of this pedal. This is the delayayayay I’ve Always wanted! I just want to make “whooooshy whooo whoooo whush” noises all day everyday and I think this pedal might be the one I’ve dreamed of. This pedal makes me feel good about procrastinating. My pedal board needs this little warm beauty. Must have. This pedal is attractive in every way possible. must have. It is excellent internally and externally, looks and sounds great. must acquire. I would love to win the Red Witch Violetta Delay. It’s a remarkable pedal and there are endless possibilities in such a sweet small package! That’s great the way that it breaks up like that. Great sound from this and all the Red Witch pedals. I have been a delay pedal fan since the beginning and the Violetta delay sounds great. It is also has an awesome oscillation sound. I would love to have this as an addition to my pedalboard, great sounding pedal and a very good video demo! thanks for the contest! The Violetta delay has to be the most powerful of it’s size on the market. The expression pedal feature was a smart addition for this compact delay. Unlike other delays with modulations, the mod on this delay isn’t wild and out right out of the box. It has a warmness to it while being turned low and can carry into those wild pitch variations at your hearts desire by turning a knob. The overall look and vibe of these pedals are amazing. Thank you for the awesome video run through. Outstanding. Really love the sound of this pedal, and as a young guitarist player starting to build up his board this would be one on my top priority! Great in-depth Review by Best Guitar Effects! Will be following you guys for a very long time! I need!!! This is awesome!!! Love the tone!!! Has good blend!!! Nice w/ the 4 adjustment knobs. I like the small box as well. Love to add this one to my rig. Sounds good, small size, and looks cool too! NICE! A small delay pedal that runs on a rechargeable battery sounds so useful. I want one! I love the simplicity and compact design of this little beauty. Teeny tiny size, yet huge sounds!! A small footprint delay would come in handy for sure! Looks like a nice delay pedal with more delay than a Carbon Copy! A nice sounding delay that doesn’t muddy up the original notes. Another great addition to any guitarist’s arsonal. A great sounding delay with a long delay time, sounds rad! I think I could have some fun with this! There will be no delay for the amazement with this pedal. I hope I win this so I can compare it to my Way Huge Aqua Puss analog delay pedal. work with expression pedal is a plus! Looks like one more great pedal to round out my board. This pedal looks cool but more importantly sounds cool. I also like the compact size. I gotta try this one out. Very cool! Could this be a Carbon Copy killer? Love it. A must have on your board. Sweet pedal, great tone, clean look! Nice sounding pedal, but where it really pulls me in is the self oscillation territory. Love that sort of thing. i can be a bit of an analog snob but this delay would do it for me anyways I think. Nothing really unusual about the delay based upon the demos…I would really need to test it myself to give an accurate comparison and rating. I like a good delay but typically I like a delay that has something unique to the pedal. If I win the Violetta I will try it and provide a review. beautiful sound , great review ! I’d like to win the Violetta Delay because I need a good versatile analog voiced delay. It also has a rechargeable battery to free up my power supply outlets for other pedals. Sounds really warm and natural! Want to hear a band take advantage of what this pedal can do, listen to Jakob. Outstanding pedal and band. Significantly better than the hollow sounding digitech digital delay presently on my board! great analog voiced digital delay – I think this sound more like an analog delay than other such voiced digital ones – Red Witch did a great job on this one. Sleek looks- can’t wait to hear more! Wow! Sounds perfect and analogue to boot. Would love to grab one of these. Wow sweet pedal, I would love to have this on my board. Thank you so much for having these giveaways! Looks like a sweet delay ! I’ve yet to get my hands on an analog pedal. This one sounds great. love it! small but powerful! That’s a really nice clean sound. I like how natural the delay decay sounds.